Posted by heldveld in Law/Gospel, Psalms, Scripture. This Psalm shows us how God’s creation displays his glory. Next we are shown God’s wisdom in his law. Yet we know that we cannot keep the law. The Psalm closes with a reminder that we need to call on God to keep us from sins. Only than can we be considered blameless. The Lord is truly our rock and redeemer. Posted by heldveld in Psalms, Scripture. In the first section of this Psalm we see the importance of relying on God. God will save those who trust in him. How well this relates to Sola Fide or faith alone. God truly is ‘abounding in steadfast love to all who call upon you’ providing salvation through his son Jesus. The next section praises God for his uniqueness and power. 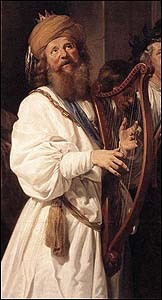 David then asks the Lord to ‘Teach me your way, O LORD, that I may walk in your truth’. What other response should we give to one so loving and wise but to desire to know his ways and walk in them? Finally David prays that God would allow his life to be a witness to ‘insolent men’. For God can grant strength so ‘those who hate me may see and be put to shame because you, LORD, have helped me and comforted me’. Again David knows that for this he must rely on the Lord’s help. Just as today we can be a witness only through the regenerating power of the Holy Spirit. What a great comfort to know that we are counted blameless through our Saviour, Jesus Christ. How thankful we should also be that we can learn God’s righteous rules as he has given them to us in his word. Our blessing is through Christ and part of our praise to him is through our attempted keeping of his statutes.